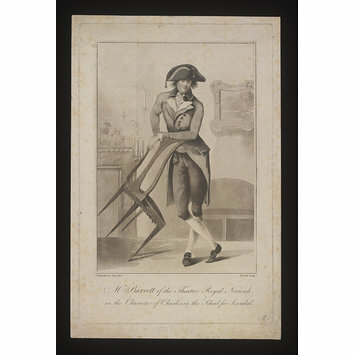 Print depicting Giles Linnett Barrett of the Theatre Royal Norwich in the character of Charles Surface in Sheridan's play The School for Scandal. Engraved by E. Scott after a drawing by J. Dunthorne. Print depicting Mr Barrett of the Theatre Royal Norwich in the character of Charles Surface in The School for Scandal. Full-length figure, standing in a room, holding a chair. 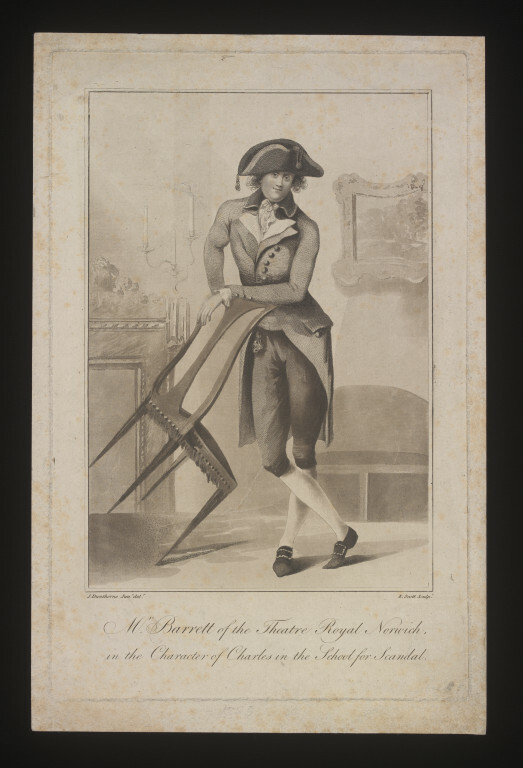 Print depicting Mr Barrett of the Theatre Royal Norwich in the character of Charles Surface in The School for Scandal. Engraved by E. Scott after a drawing by J. Dunthorne.